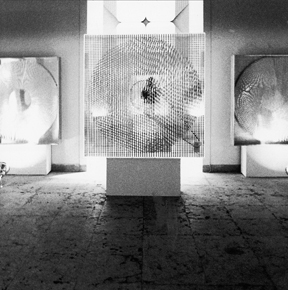 Heinz Mack’s sculptures can be distinguished by the multifaceted use of materials – such as stone, metal, wood, gypsum, sand, glass or ceramic – as well as by their elementary and powerful character in combination with light and/or movement. In Mack’s oeuvre there is a broad spectrum of sculptures. 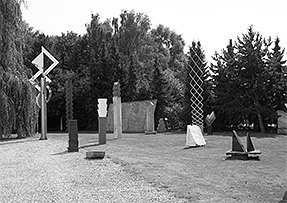 The stele – being the earliest group within the sculptural works – employs the light for a visual transformation and also concretizes the room by becoming its energetic central point. The motor-driven rotors generate the typically dynamic movement, creating an ongoing variation within the artwork. “Ideally a certain space, a certain light, a certain sculpture and a certain viewer will come together; this seems a natural course, but it is not“, says Mack. 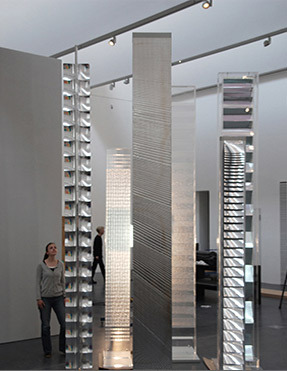 The light-reliefs accentuate the central principle of the articulation of light along with the immaterial appearance. As defined by their charismatic appearance the wing- and paravent-works are closely related to the reliefs. For these, Mack primarily employs aluminum from aero- and cosmonautical technology. The artistic intention to visualize light, structure and movement, also becomes apparent in these works. 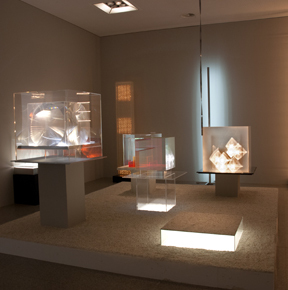 Light-objects and light-kinetic works show an ideal combination of light, movement and transformation within the artwork. Water- and fire-sculptures are experienced as environments, and cubes, prisms as well as mirrors are presented singularly but also installatively.